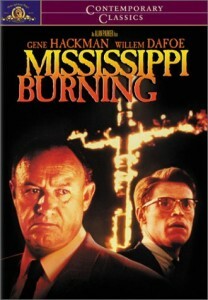 Set in the same year that Martin Luther King received his Nobel Peace Prize, the film is a fictionalized account of a true story, the murder of black activist James Chaney and white colleagues Andrew Goodman and Mickey Schwerner, three young civil rights workers who were part of a voter registration drive in Mississippi. Civil Rights workers Michael Schwerner and Andrew Goodman, both white New Yorkers, went to Philadelphia, Mississippi in 1964 as volunteers with CORE, the Congress on Racial Equality, to aid in the registration of African-American voters as part of the Mississippi “Freedom Summer” Project. They and fellow volunteer James Chaney, an African American from Mississippi, disappeared on the evening of June 21. The FBI recovered their bodies, which had been buried in an earthen dam, 44 days later. The case was solved by paying a $30,000 bribe to a Klan informant. The Neshoba County deputy sheriff and 16 others, all Ku Klux Klan members, were indicted for the crime; seven were convicted. This was a crucial turning point in the civil rights struggle which led up to the Voting Rights Act of 1965. It is hard for people who did not live through the 1960s to believe that such hatred, violence and racism existed in this country less than 40 years ago. Some critics have complained that the film depicts the action as being led by crusading white law-enforcement personnel on behalf of a herd of meek, passive, helpless blacks, and it has also been criticized for glorifying violent FBI tactics at the expense of the nonviolence advocated by Dr. King. Despite its flaws, Mississippi Burning starkly brings home the horror of the South in 1964. 1. Bombing of black churches. After finding the abandoned car of the three missing civil rights workers, the FBI calls in reinforcements to search the swamps for their bodies. In retaliation, the Ku Klux Klan burns several black churches. A young boy speaks at a meeting at a firebombed church and explains that they are crusading for respect and dignity. Several white citizens, including the Sheriff, maintain that it is all a hoax..
2. KKK invades black church, media interviews. A black church service is in progress; the KKK interrupts it and beats up several of the worshippers, including a young boy identified as a troublemaker. Followed by interviews with the media where most white citizens express feelings that blacks are subhuman. The KKK burns a house and a young boy, tending his chickens, is a witness. A friend convinces him to help the FBI. He identifies the perpetrators, who go to trial and are let off with a suspended sentence by a sympathetic judge. 1. Guided by Dr. Martin Luther King, Jr., and other practitioners of nonviolence, the African-American people in the South did not meet violence with more violence. What is the difference between being nonviolent and being meek and passive? What do you think might have happened if the black people in Mississippi had started burning down white churches, or lynching white people? 2. Many of the white people of Mississippi were resentful of “outside agitators” whom they blamed for stirring up the black population. Could this movement have been more effective if it had been composed solely of people, white and black, who lived in the area? 3. People died and suffered countless hardships and indignities to gain African-Americans in the South the right to vote. Yet in the 1998 elections, less than 30% of the eligible voters in Mississippi cast their ballots (compared to just under 40% nationwide and only 27% in Texas.) Was is worth it? Why are civil rights, including voting, important? 4. What things have changed for the better in civil rights since 1964? What things have stayed the same? Have some things become worse?